After a couple of years of fairly typical "club cycling" I met my big goal, riding an English century (100 miles) at the Bike MS New Bern Ride in 2009. I was surprised that it wasn't nearly as hard as I'd imagined, so on the 2nd day of the Bike MS event I rode my 2nd English century! 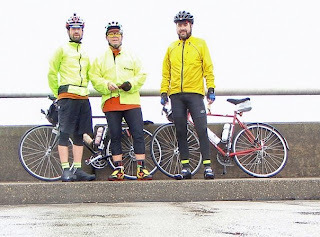 Sometime the following month I was riding on a Sunday morning with Geof and Byron when Geof suggested that I make a new goal- to ride the Kerr Lake Loop 200K permanent by the end of the year. I believe his exact words were: "Now that you've done the back-to-back centuries you can do a 200K... It's only 125 miles!" I remember it very clearly because that was the exact moment that started my addiction to randonneuring. On the morning of November 1st, 2009, I presented myself at the start of the Kerr Lake Loop with my application for membership in Randonneurs USA. It was about 50 degrees and raining. I had read enough about randonneurs to know that they take pride in riding no matter the weather, so I didn't want everybody to think I was a wuss by not showing up because of the rain! That was the first of many epic rides. That was also the day I discovered why I'd had so much leftover energy after my 1st 100 mile ride 2 months earlier. The New Bern ride is very flat. Group riding and drafting was the order of the day. I probably only did 6 or 8 turns on the front of the pack out in the wind over the whole 100 mile course. There were rest stops every 10 miles stocked with water, Gatorade, snacks, and bike mechanics. Randonneuring is different- self-sufficiency is key. The Lake Loop is not flat. Heading out from North Raleigh and traveling up to Virginia, around Kerr Lake and back involves a fair amount of climbing. Randos ride their own pace, so when I couldn't keep up on the uphills I'd be out in the wind on my own. That's not to say that my riding buddies just dropped me heartlessly- Geof and Byron spent the whole day keeping me in sight, stopping and waiting for me at the turns. After about 90 miles the cumulative effects of hills, wind, cold, and rain had really done a number on my knees. The pain was such that I could no longer stand while climbing and I could barely spin my lowest gear. I slowly clawed my way up yet another climb, and there at the top was a little convenience store with Geof and Byron once again waiting for me. I went in to purchase some Advil and came out to find that Byron had applied some oil to my chain for me. They looked out for me the rest of the ride, and at the end everybody congratulated me on becoming a Randonneur and finishing a truly epic ride. Since that day I've done a lot more randonnuering. I completed a full Super Randonneur series of 200K, 300K, 400K, and 600K rides, and also an R-12 award for at least one 200K per month for 12 consecutive months. Much of that riding has been by myself, but I've also made great friends along the way. I've seen a lot of the NC countryside in all sorts of weather. Foggy mornings and stunning sunsets, steam rising from hot asphalt just after a summer thunderstorm, and falling snowflakes in the beams of my headlights . I've been chased by unknown animals in the dark- or maybe I hallucinated that. Many times I've thought about Robert Frost's little poem while stopped briefly on the side of the road for one reason or another. Sometimes I take a picture, or adjust something on my bike or my clothing, or perhaps take a short nature break. But I always have to get back on the bike and keep pedaling. For I have promises to keep... And miles to go before I sleep. I love that poem too! Wonderfully keen description of the rando addiction experience and the first KLL ride. Congratulations on your series and R-12! Looking forward to reading the blog and riding with you a time or two.